These web services APIs can be accessed by many different kinds of clients, including non-portlet and even non-Java clients. You can use Service Builder to generate similar remote services for your projects’ custom entities. When you run Service Builder with the remote-service attribute set to true for an entity, all the classes, interfaces, and files required to support both SOAP and JSON web services are generated for that entity. Service Builder generates methods that call existing services, but it’s up to you to implement the methods that are exposed remotely. Let’s use Service Builder to generate remote services for the Nose-ster Event Listing portlet example project. You’ll implement a few methods for the Event Listing portlet that can be called remotely via SOAP and JSON web services. Each remote service method performs security checks to determine whether the caller has permission to add/update/delete events. We cover Liferay’s security and permissions system in Chapter 12. To see how the Event Listing portlet is integrated with Liferay’s permissions system, browse the Event Listing portlet project available in the Dev Guide SDK at https://github.com/liferay/liferay-docs/tree/6.1.x/devGuide/code/devGuide-sdk. The project is in the SDK’s portlets/event-listing-portlet. folder. Notice also that we modified the deleteEvent method of the EventServiceImpl class passing it an event ID as a parameter instead of an entire event object. The method is now ready to call as a remote web service. After you finish adding imports to EventServiceImpl, save the class and run Service Builder again. Liferay uses Apache Axis to make SOAP web services available. Axis requires a Web Service Deployment Descriptor (WSDD) to be generated in order to make the SOAP web services available. Liferay provides a build-wsdd Ant target that generates the WSDD. In Liferay IDE or Developer Studio, when viewing your service.xml file in Overview mode, there’s a button in the top-right corner of the screen for calling the Build WSDD target. Liferay Portal makes your service’s Web Services Definition Language (WSDL) available after you’ve built its WSDD and deployed your portlet project. Let’s learn how to call your remote services next. Each entity’s available operations are listed on the plugin’s JSON web services API page. If you’ve been implementing the Nose-ster Event Listing example portlet used throughout this chapter, you’ll be anxious to try out its remote web services. You can invoke JSON web services directly from your browser. For example, to bring up a test form for your Event entity’s delete-event operation, visit the above URL and click on its delete-event link. Figure 4.10: You’ll see a page displaying the name of the service method, its required parameters, its return type, possible exceptions it can throw, and a form for entering its parameters. The only parameter required for the delete-event operation is an event ID. Since there’s no UI yet for the Event Listing application, you probably don’t have any events in your database. But if you did, you could check for an event’s ID in your Event_Event database table. Then you could enter the value into the eventId field in the test page’s Execute section and click Invoke to delete that event. Liferay returns feedback from each invocation. Service Builder can also make your project’s web services available via SOAP using Apache Axis. After you’ve built your portlet project’s WSDDs and deployed the project as a plugin, its services are available on the portal server. It’s easy to list your Nose-ster Event Listing plugin’s SOAP web services. You have two options: you can access them in Liferay IDE or you can open your browser to the URL for its web services. To access your SOAP web services in Liferay IDE, right-select your portlet from under it’s Liferay server in the Servers view. 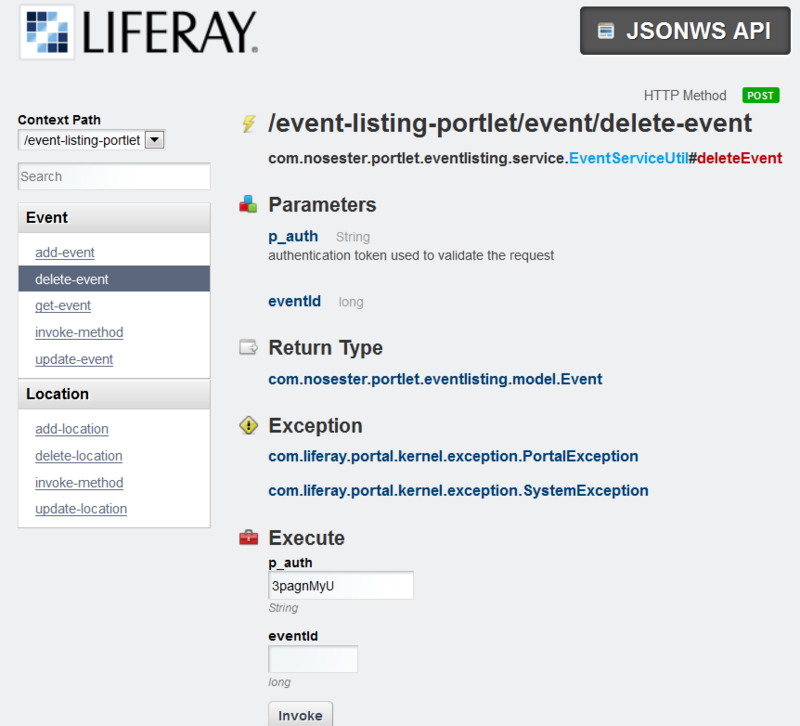 Then select Test Liferay Web Services…. This WSDL document lists the Event entity’s SOAP web services. Once the web service’s WSDL is available, any SOAP web service client can access it.